Brett Griffin is the spotter for Clint Bowyer in the Monster Energy NASCAR Cup Series. He broke ground on the announcement. Call it a soft open as an official announcement has not been released. However, if true, teams would have likely already been made aware of it well in advance to prep for the race. “This is going to happen,’’ said Brett Griffin on the podcast “Door Bumper Clear podcast via Dale Earnhardt Jr.’s Dirty Mo Radio. This sounds cool as hell,” Dale Earnhardt Jr responded to the rumors via twitter. The NASCAR Xfinity Series brought ducts that move air to the trailing car. The holes are punchd in the nose and guide air to the sides of the car and then to the car behind. This was an effort to lessen the effects of modern day aero racing. The ‘accordion’ which Kyle Busch described at Texas. You can get within a few car lengths of a car. However, if you get too close, all the air is removed from the nose. This makes the car push up the track and it makes it really difficult to get a run or for fans to see much side-by-side racing. In addition, the NASCAR Xfinity Series package for Indianapolis featured restrictor plates and a taller spoiler. The larger spoiler was designed to make the toe effect larger down the straights. 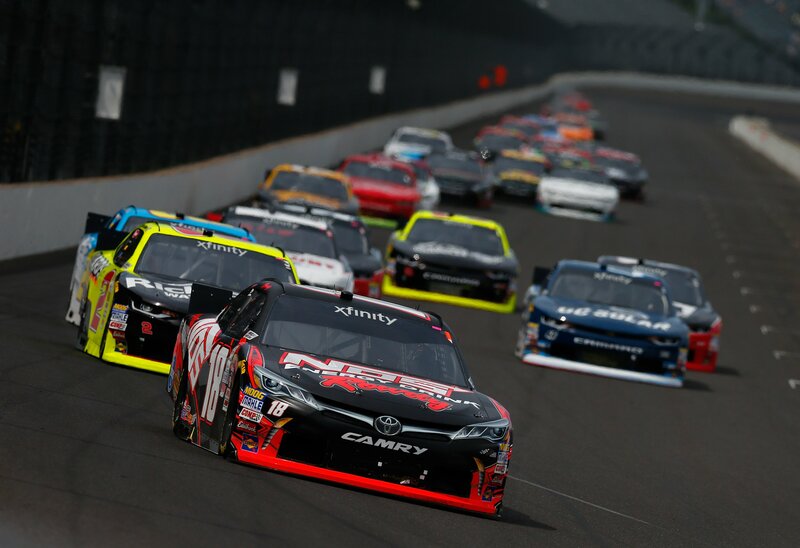 Each of these things were put into place to create better and closer racing at Indianapolis, a track that has seen lackluster crowds in recent years. For 2018, the NASCAR Xfinity Series restrictor plate package has been expanded in it’s usage. It will now be used at Indianapolis, Michigan and Pocono. The All-Star race came under criticism in 2017. It was expected that the new Charlotte Roval would be used for the All-Star race. That turned out not to be the case as it’s instead been placed in the playoff’s. The installment of the restrictor plates would likely create a buzz around the event. This would likely be used as a test. Stage racing and double-file restarts stemmed from their first installment in the Charlotte All-Star event. Will it work? Maybe. That Xfinity race was a lot better than I’ve seen in years past. But, the package has yet to be tested on a 1.5-mile oval. The NASCAR All-Star race will run on May 19 in Concord, NC.